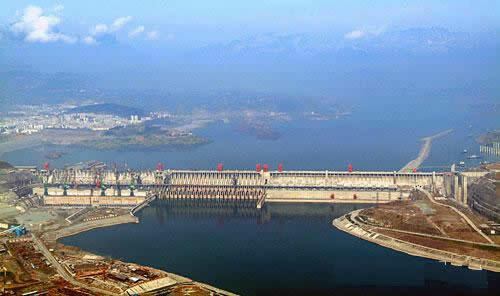 The flow of the river is captured with either dams or independent turbines. A combination of precipitation from drainage basins, groundwater springs, and snow melt creates rivers that flow towards a lake, sea, or ocean as part of the natural hydrological cycle. The movement of dense water can be converted to energy. Even though this technology is not technically marine renewable energy, it is often grouped because of similarities. Environmental effects will vary between the two most common approaches: turbines and dams. Turbines can be used to capture kinetic energy from flowing water (rivers, streams, canals, creeks). 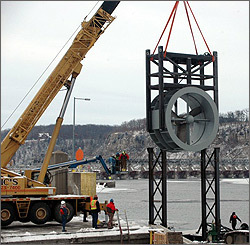 Turbines can be mounted on the ground, attached to a floating or fixed structure, or suspended in the water column. The technology is similar to tidal energy, except that the flow moves in only one direction, while tides fluctuate in both directions. The main environmental concern is collision between turbine blades and marine organisms due to natural animal movements, attraction to the device, or inability to avoid turbines within strong currents. It should be noted that these turbines spin much slower than propellers on ships, and that marine mammals are typically less common in most rivers. There is some concern that noise from the turbines can affect animals that use sound for communication, social interaction, orientation, predation, and evasion. As with all electricity generation, there is a slight concern that electromagnetic fields generated by power cables and moving parts may affect animals that use Earth's natural magnetic field for orientation, navigation, and hunting. Likewise, chemicals, such as anti-corrosion paint and small amounts of oil and grease, may enter the waterbody during spills, though some turbine designs do not require lubrication. Large-scale energy removal (from arrays) may alter the natural physical system, potentially affecting the ecosystem, though this may be seen as a benefit for flood protection. Dams create large reservoirs used for energy generation by blocking water that naturally flows freely through a river or stream. Turbines are used in dams to create energy from the height difference in the water level on either side of the dam, typically using penstocks to feed water through a turbine. Creating these blockages prevents fish migration that can impact population levels for species, though some mitigation can occur with the installment of fish ladders. Fish are also at risk of being pinned against screens filtering the intake valve or passing through turbines and experiencing collision or barotrauma. Sediment flow through the river is an important part of a natural ecosystem, and as dams alter the flow or a river or stream changing sediment flow can have a wide range of impacts. For instance, preventing sediment flow can cause additional erosion downstream as the system attempts to replenish nutrients provided in the sediment. Reducing natural flow may also cause poor water quality as contaminants are trapped in the reservoir. Dams can also cause wide reaching impacts as the upstream habitat is flooded, to create a large reservoir, altering the ecosystem and its functions. It should be noted that very little of the content contained in Tethys deals with the environmental effects of dams, as this falls outside the focus area.